AUGUSTA, Ga. -- Former All-Americans Ben Crenshaw and Jordan Spieth will represent Texas Men’s Golf in this week’s Masters Tournament at the Augusta National Golf Club beginning Thursday. Two-time Masters champion Crenshaw will be making his 43rd appearance at the Masters Tournament this year. Crenshaw won his first Green Jacket in 1984 and his second 11 years later. Along with two wins, he also acquired two second and third-place finishes at Augusta National. Spieth, who earned the 2013 PGA Tour Rookie of the Year and finished ranked eighth in the FedEx Cup Standings last season, secured his first invitation to the Masters Tournament after defeating Zach Johnson and David Hearn in a 5-hole playoff at the John Deere Classic last July. Besides winning the John Deere Classic, the 20-year-old has made outstanding strides since December 2012 when he turned professional. Spieth has collected 13 top-10 finishes on the PGA Tour and $5,709,043 in career earnings. Crenshaw was a student-athlete at Texas from 1970-73, the forefront of the future for Texas Golf. He was a catalyst on the team to help the Longhorns earn their first (1971) and second (1972) NCAA Championship titles as a team in golf. Along with those accomplishments, Crenshaw also clinched three individual NCAA Championship titles. 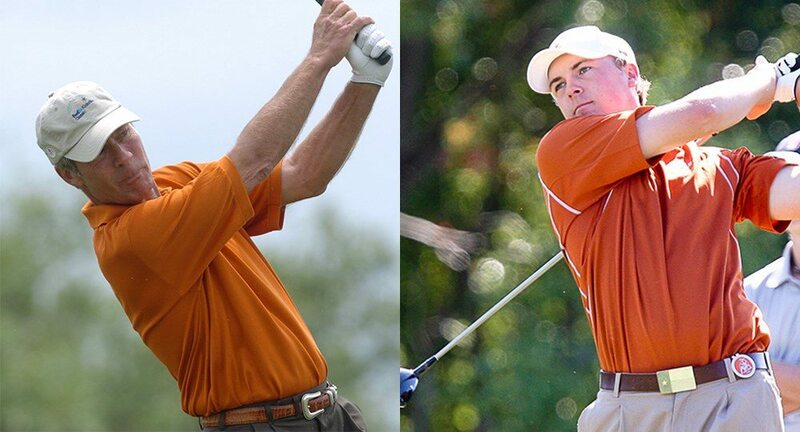 Forty years later, Spieth came to Texas to help lead the Longhorns to their first team NCAA Championship since Crenshaw’s era. In Spieth’s freshman season at UT, he also earned the Big 12 Conference Player of the Year, Freshman of the Year and was one of three finalists for the 2012 Ben Hogan Award which is presented annually to the nation's top amateur golfer. Spieth will play alongside Rory McIlroy and Patrick Reed in the first and second rounds, while Crenshaw is paired with Y.E. Yang and Jonas Blixt. Spieth’s group tees off of No. 1 at 9:52 a.m. Central Thursday and12:59 p.m. Friday (No. 10). Crenshaw begins at 7:07 a.m. Thursday (No. 1) and 10:14 a.m. Friday (No. 10). First and second-round television coverage of the 80th Masters Tournament will be on ESPN, while CBS will broadcast the weekend rounds.